There is no need to generate an enzyme-conjugated version of each primary antibody. For our Western blot, we will use a primary antibody that recognizes pre-pro-α-factor to identify the various forms of α-factor that accumulated in the sec18 and sec61 yeast strains that were shifted to the non-permissive temperature (37°C). Remember that pre-pro-α-factor is the entire polypeptide that is synthesized by the ribosome, including the ER signal sequence and other sequences that are removed by proteolysis to generate the final, secreted form of α-factor. The anti-pre-pro-α-factor antibody was generated in a rabbit. 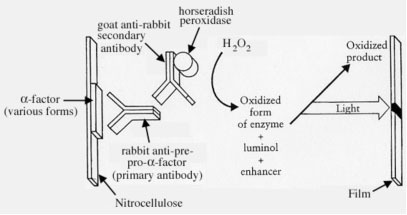 We will therefore use a goat anti-rabbit antibody as our secondary antibody. This antibody is linked to the enzyme horseradish peroxidase (HRP), which will be used to visualize the immunoreactive proteins by a method called enhanced chemiluminescence. Luminescence refers to energy that is dissipated in the form of light when some molecules transition from an excited state to their ground state. When the excitation of the molecule is caused by a chemical reaction, it is referred to as chemiluminescence. Examples of chemiluminescence are the light produced by fireflies and the glow of Halloween light sticks. In the chemical reaction that will be used to detect the HRP-conjugated goat-anti-rabbit antibodies on our Western blots, the light releasing molecule is a compound called luminol. Luminol is commonly used in crime scene investigations to visualize traces of blood. Luminol is mixed with hydrogen peroxide (H2O2) and is applied to the surface that is being investigated. If traces of blood are present, the iron in the blood acts as a catalyst in the oxidation of luminol, which is accompanied by blue-green luminescence. In our case, the HRP linked to the secondary antibody will catalyze the same reaction, and we will detect the light produced by exposing our blots to blue light-sensitive film. Figure 1 below provides a summary of the detection method. Enhanced chemiluminescence refers to the fact that, in addition to the H2O2 and the luminol, the developing solutions we will use also contain some additional chemicals (enhancers) that increase the intensity of the light produced in the reaction. Figure 1. A summary of the ECL Western blot detection method. The secondary antibody is conjugated to the enzyme horseradish peroxidase (HRP). When this enzyme is activated by hydrogen peroxide (H2O2) and provided with the substrate luminol, the luminol becomes oxidized and releases light, which can be detected on film. When the film is developed, the spots on the blot where the antibodies have bound will be black. The enhancers are additional chemicals that amplify the light produced from the reaction. Pour off the blocking buffer into the sink (try to leave as little volume as possible so the primary antibody will not be further diluted). Add the primary antibody (rabbit anti-pre-pro-α-factor), which has already been diluted 1:1000 in 10 ml of blocking buffer. Incubate on the rocker for 1 hour. *Note: you will need to save the primary antibody for use by other lab groups. Do not discard it after the incubation is finished. Return the primary antibody solution to the conical centrifuge tube and give it back to your instructor (try to recover as much volume as possible). Pour PBST wash buffer onto the nitrocellulose so that it is submerged by approximately 0.5 cm of liquid. Incubate 10 min. on the shaker. Pour off the wash buffer into the sink. Add fresh wash buffer and incubate another 10 min. on the shaker. Repeat Step 4 once more (a total of 3 10-min. washes). Add the HRP-conjugated goat anti-rabbit secondary antibody that has been diluted 1:2500 in 10 ml blocking buffer (i.e. add 4 µl of antibody to 10 ml of blocking buffer). Incubate 30 min. on the shaker. Pour off the secondary antibody solution into the sink (you do not need to save this). Wash three times with PBST (10 min. each wash) as you did after the primary antibody incubation. After the last wash, remove all residual wash buffer by tilting the blot container onto a paper towel. *Do not proceed with the following steps until your instructor is available to help you with the film exposure and developing. Leave your blot in the final batch of wash buffer until that time. The following directions for performing the ECL may be different depending on which manufacturer’s kit we use. Check with your instructor to see if the following step (ratio of reagents 1 &2) needs to be modified before proceeding. Pipet 2 ml of ECL detection reagent 1 into a 15-ml conical tube and add 2 ml of reagent 2 and invert to mix. Be sure to use a clean pipet for each detection reagent — it is important for the two solutions not to mix until just before you use them! Make sure that you record all the kit information in your lab notebook as the reagents are proprietary. You will need to include manufacturer information for using this kit in your M&M section since you don’t know the ingredients and concentrations for these reagents. Pour the mixed ECL developing solution onto your blot. Make sure all the membrane is in contact with the liquid by rocking the container slightly back and forth by hand for 1 min. Discard the ECL reagents in the sink. Working quickly but carefully, use forceps to place your blot onto a piece of paper towel. Using another piece of paper towel, gently blot the nitrocellulose to remove excess liquid. Use forceps to place the membrane blot—protein side up—between the two plastic sheets of a page protector that has been taped into an autoradiography cassette. Flip the switch to turn off the normal light and turn on the safe light. (Also, make sure the computer monitor in the room is turned off.) Open the film container and remove one piece of film. Be sure you actually get a piece of film and not one of the thin paper sheets that divide the films. Place the film onto the blot and close the cover of the cassette (be careful not to move the film once it has been placed on the blot). Wait ~1 min. to 90 sec., then open the cassette and remove the film. Estimate the molecular weights of all the bands on your developed film. Just approximate based on the MW markers—you do not need to construct a standard curve as you did for the GelCode Blue-stained gel in the β-gal lab series. What are the dark bands that are present in each sample and what do they represent? What are the likely reasons for the differences in their sizes? Use your knowledge of the specific defects of the sec18 and sec61 strains to help you interpret your data. Also consider what it means if no α-factor signal is present for some of the samples. This page was last edited on 24 May 2011, at 08:00.